Commonwealth Secretary-General Rt. Patricia Scotland QC made a courtesy call on Minister of Development Strategies and International Trade Malik Samarawickrama, along with an accompanying delegation comprising Deputy Head of the Secretary General’s office Senyo Agbohlah, Director Media and Public Relations Prof. Barnie Choudhury, Political Officer Asia/Europe Regions Jonathan Cheng, and Assistant Communications Officer Snober Abbasi at the ministry. The meeting was attended by Secretary to the Ministry Chandani Wijewardene, Adviser Eng. 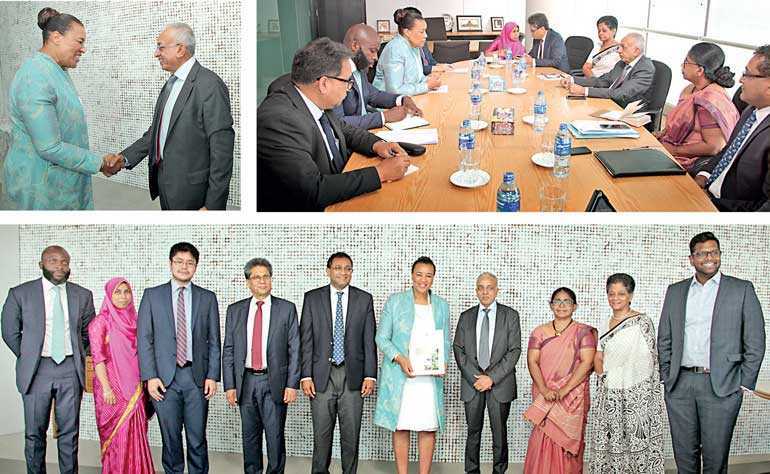 Mangala Yapa and Adviser Anushka Wijesinha – Ministry of Development Strategies and International Trade, Export Development Board Chairperson Indira Malwatte, Board of Investment Director General Duminda Aryasinghe and a representative of the Ministry of Foreign Affairs.